After over sixty years of Parliamentary democracy in India, people have started losing faith in it as it has become synonymous with elections only. The victim of democracy is the politics. If in India, people are asked to vote for an institution that has maintained some level of integrity – they would vote for the Supreme Court, Election Commission or to the Comptroller and Auditor General of India. Their last preference would be either Parliament or State Assemblies. In the parliamentary democracy till the leaders become responsible, conscious of their duties and responsive to the public opinion, democracy itself will not be stable. If they start ignoring the will of the people, the government will become dictatorial. In India, politicians are looked upon with disdain. There is reason for this. Politicians whom people elect with much fanfare tend to become the arbiters and abusers of power. The realization of social and economic justice, as promised by the Constitution still remains a dream, and the system of administration has reduced and limited the sovereignty of the people to a mere right to exercise their franchise at elections. Gloomy, harsh, unimaginative and indifferent administration has affected the poor to their core. Corruption, inefficiency and insensitivity, particularly in the distribution of goods have given rise to extra-legal systems. The people in India today stand more divided amongst themselves than at the time of the country’s independence. Common national purpose is seldom seen pursued by the national political parties and noble purposes of public life have degenerated into opportunistic and self seeking politics of competitive personal gains. Corruption, it seems, has been legalized, particularly in political life. Electoral reforms and reforming of the political parties and their internal democracy are essential parts of reform.The politician- bureaucrat nexus have eroded administrative credibility. Unprincipled, opportunistic political re-alignments and defections and re-defections minimize the scope of the stability of the governments. The instability of the governments gave rise to maladministration which has paralyzed the creative energies of the people. The opportunistic and self seeking politics and politicians and an increasing scenario of politician, criminal and the bureaucratic nexus has resulted into enormous corruption in electoral, political and bureaucratic spheres. There is pervasive degeneration of values. In view of the prevailing atmosphere, the foremost requirement is the restoration of confidence in the institutions of democracy. This needs strong and enlightened leadership to address the emergent problems of divergent nature dealing with the aspirations of the people and requirements of the country. Besides the politicians, bureaucrats and criminals, the voters are also responsible, to some extent, for the prevailing situation because they do not discharge their civic duty honestly. The alarming increase of violence and money influence in the electoral process is a matter of grave concern which threatens the very survival of the democratic system. Besides the frustration from political and administrative side, there has been a picture of near collapse of the judicial trial system. The delays and mounting costs of the cases have kept the general people away from justice, thereby causing frustration and blocking of their aspirations. The percentage of cases that go through the whole processes in courts is quite large which urgently need exploration of some other means. There has been increasing disillusionment about the fairness of electoral process. Corruption and criminalization has over-shadowed its processes. The enormity of the costs of elections has kept the suitable persons away from this exercise and has led to the degradation of political processes to detriment of common good. Political parties collect enormous funds from criminals and capitalists for meeting electoral expenditure, thereby causing pervasive degeneration of standards in public life. This is also reflected in the quality of governments and of the governing process. The above mentioned systematic and constitutional failures were foreseen by some members of the Constituent Assembly and they had raised their doubts in the discussion of the Constituent Assembly. Damodar Swaroop Seth, a member of the CA had raised similar views in the discussion held on 5th November 1948. He had said “this Constitution as a whole, instead of being evolved from our life and reared from the bottom upwards is being imported from outside and built from above downwards. A Constitution which is not based on units and in the making of which they have no voice, in which there is not even a mention of thousands and lakhs of villages of India and in framing which they have had no hand, well you can give such a Constitution to the Country but I very much doubt whether you would be able to keep it long”. Participating in the debate on the same day (5th November, 1948) HV Kamath had said “Now, what is state for? The utility of state has to be judged from its effect on the common man’s welfare. The ultimate conflict that has to be resolved is this: Whether the individual is for the state or the state is for the individual”. Even after over sixty years of independence the country is still reeling under the heat of minority and reservation. While participating in debate in Constituent Assembly Krishna Chandra Sharma (United Province: General) had said” I do not think our minorities are minorities in the real sense of the of term or classes or groups accepted by the League of Nations. We all lived in this Country for centuries, for thousands of years. We have imbibed a common culture, a common way of living, common way of thinking. Thus, I do not understand the meaning of giving these special privileges in chapter XIV. It creates statutory minorities and to say that the thing will last for ten years only is to forget the lesson of the past……But the result was the partition of the Country”. 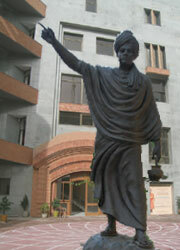 He suggested” if there are any safeguards or any encouragement necessary for the backward classes or certain other classes, there might be other means namely, giving scholarship to deserving students, giving other financial help, opening institutions and other facilities which are necessary for their amelioration and lifting up; but to perpetuate division in body politic, to perpetuate division in the nation, would be detrimental to the healthy growth of the nation and would do an incalculable harm to us and our prosperity”. During six decades the country has grown from 10 states to 28 states with seven Union Territories. The population has grown from 36 crores to 1.2 billion; it has become sixth largest economy in the world; the literacy rate has grown; and the country is today a nuclear power. Inspite of this progress, country's track record to fight against poverty, illiteracy and corruption are shockingly by below the poverty line. The largest democracy in the world has moved in the direction of instability and crisis of governability. The gradual decline in value system, erosion in political order and a deepening of social and economic crisis have brought the Indian political system to cross roads. Now the time is ripe for the people and its leaders to take a decision about the future course of action. It is no denying a fact that despite all those shortcomings, the people of India have reposed their faith in the democratic process, they maintained the democratic system. But democracy gets strong roots where its plantation proceeds from social to economic and then to political. In India, instead of social democracy taking strong roots ahead, the economic and political democracy arrived earlier. As long as equality and social justice are not visibly present, only voting rights can not bring about change in the profile of a society which was under alien control for centuries. Today, in the 21st Century can we say that the real power to govern this country is vested in its people? Often question arises that does the Constitution in true terms express the will of the people or it has just become a tool in the hands of some hungry politicians? Are the people of India in real terms assured of justice, liberty, equality and fraternity? Is the common man receiving justice? Does equality really prevail? Has the Constitution not failed to translate noble principles into practical instruments? Its glaring inadequacy is seen in the dispensation of justice, protection of basic liberties enforcement of bureaucratic accountability and appointments of constitutional functionaries. The nature of the Constitution of India is not Indian. The Constitutions of USA and Britain has been copied. Some articles have been borrowed from the Constitutions of Ireland, Australia and Canada besides being dependent upon the Government of India Act 1935. Thus, the very nature of the Indian Constitution is a slavish imitation of the Constitution of these Countries. Due to the mismatch in the nature of the Constitution, it has been amended more than 110 times during last sixty years. On the other hand when we see the Constitution of United States which was presented on 17th September 1787 with only eleven articles has so far, been amended only twenty seven times. This comparison speaks volume of the mismatch of the Constitution with the Indian condition. The need for Constitutional review has been a topic widely debated across the Country. The founding fathers of the Indian Constitution who granted more rights to the people without balancing them with their duties, perhaps did not foresee the emergence of present political environment, wherein the political players of the various segments in the country are more interested in fulfilling their individual aspirations than the aspirations of the people. The debate to review the Constitution started right from the first decade of the enforcement Constitution and within two years of its coming into force, it was required to be amended vide first amendment Bill 1951. During the period from 1950 to 1967, the Parliament and most of the state assemblies were under the rule of the Congress Party. But after 1967 non-congress coalitions took over the reign of power in several northern states. During this period several issues pertaining to union-state relations cropped up. In the period following fourth General Election there was wide spread concern over the phenomenon of unprincipled defections. The problem came up for discussion in the Lok Sabha on 8 December in 1967. The Parliament adopted a resolution which said” The House is of opinion that a high level committee consisting of representatives of political parties and Constitutional experts be setup immediately by Government to consider the problem of legislators changing their allegiance from one party to another and their frequent crossing of the floor in all its aspects, and make recommendations in this regard”. Following Parliament resolution, Y B Chavan (Home Minister) committee was formed which addressed variety of issues including the problem of defections. Subsequently the Congress president D. K Barooah appointed a committee on 26 Feb 1976 to study the question of amendment of the Constitution. The 12 member committee headed by Sardar Swarn Singh submitted its report to the Congress President in April 1976. The committee in its recommendation touched upon wide range of issues including the Preamble, Directive Principles, Power of Parliament to amend Constitution, Election matters, disqualification of membership of House or State legislature etc. On 27- October 1976 the 42nd Amendment Bill was presented in the Lok Sabha. The Prime Minister Mrs. Indira Gandhi in her speech said that the purpose of the Bill was “To remedy the anomalies that have long been noticed and to overcome obstacles put up by economic and political vested interest”. She said “the Bill was responsive to the aspirations of the people and reflects the realities of the present time and the future”. The Bill was passed in the Lok Sabha with 4 against it and 366 in favour and in Rajya Sabha passed by 190 Votes in its favour and none against it. The amendment led to imposition of Emergency in the country which is a dark period of the Indian democracy. After change of the Government in 1977, the then Prime Minster Morarji Desai appointed a committee of the Members of Parliament and subsequently set up a sub-committee of the cabinet mainly to correct imbalance in the Constitution caused by some provisions of the 42nd amendment. In 1983, a committee was constituted under the chairmanship of justice R S Sarkaria with fairly wide ranging terms of reference. The NDA in its National Agenda for Governance issued as its Election Manifesto had pledged to appoint a commission to review the Constitution. The pledge was affirmed in the President’s address to the Parliament on 22 February 2000. Accordingly on 23rd February 2000 the President of India appointed II- member Commission headed by Justice M N Venkatachaliah, Former Chief Justice of India. The Commission was named as “The National Commission to review the working of the Constitution“. The terms of reference of the Commission stated - The commission shall examine, in the light of the experiences of the past 50 years, as to how best the Constitution can respond to the changing needs of efficient, smooth and effective system of governance and socio- economic development of modern India within the framework of Parliamentary democracy and to recommend changes, if any, that are required in the provisions of the Constitution without interfering with its basic structure or features.” The Drafting and Editorial Committee of the commission submitted the complete Draft Report to the chairperson on 15 February, 2002. It is not known as to what action was taken thereafter. During last two decades there have been persistent demands from the civil society, some NGOs, academics, Constitutional scholars and others to have a comprehensive review of the Constitution. Several books and large number of articles and research papers are published, and numbers of seminars have been organized on this topic. There is a general feeling that a review of the Constitution will have a positive impact on the system which will neutralize the hurdles in governance. A Constitution is meant to facilitate the working of the government and administration and also to guide other structures of the country. The static form of the Constitution will not be able to meet the challenges of the situations and requirement of the changing world. Pandit Jawaharlal Nehru while speaking on the Draft Constitution on November 8, 1948 said “The Constitution is after all some kind of legal body given to the ways of Government and the life of the people. A Constitution if it is out of touch with the people’s life, aims and aspirations becomes rather empty, if it falls behind those aims, it drags the people down. It should be something ahead to keep people’s eyes and minds made up to a certain high mark... Remember this that while we want this Constitution to be as solid and as permanent a structure as we can make it... there should be certain flexibility. If you make anything rigid and permanent you stop a nation’s growth, the growth of a living, vital, organic people”. Pandit Nehru reiterated this view over and over again on different occasions. It is now high time that instead of amending one clause or the other of the Constitution, we must gather courage to review the suitability of this Constitution to the people, culture and civilisation of this country. It must be emphasised that a Constitution of the country has to be deeply rooted to the cultural and civilisational ethos of the country.